If you come to Hania by ship in the spring or early in the summer, you can make out, very far off, the snow-capped peaks of the Lefka Ori (the White Mountains).They owe their name not only to the fact that they are covered in snow for most months of the year, but also to the characteristic light grey/white colour of their limestone rock. This imposing mountain range rises smoothly from the northern shores of Crete, ends in 57 peaks above 2.000 metres (the higher peak being Pachnes at 2.452 m) and falls steeply to the southern shores, forming imposing gorges. On the smooth northern slopes of the Lefka Ori are built dozens of interesting villages, both large and small, like the historic Theriso, the picturesque Thymia, Tsakistra, Madero and Melidoni. There are a few accessible dirt roads which climb to the heart of the mountain, the most impressive being the one that ascends from Theriso and reaches the foot of the Kaloros peak. In the main massif of the Lefka Ori, there are only paths used by shepherds and mountaineers.There are also four very nice mountain refuges, those at Kalergi, Katsiveli, Volika and Tavris. They all belong to the E.O.S. of Hania (the Greek Mountaineering Association of Hania) with which you must get in touch if you want to use the refuges (tel. 0821-44647). The most impressive gorges in Crete are to be found on the southern precipitous slopes, such as the famous gorge of Samaria (or the Farangas, as the locals call it) and others which are less well-known but equally beautiful, like the Gorge of Tripiti (a part of which you can cross by motorcycle! ), and the gorges of Eligia, of Aghia Irini (St Irene) and of Klados. The famous Omalos plateau is situated at an altitude of 1.000 m in the western corner of the Lefka Ori - the road to Xiloskalo goes past here, and from there you can walk through the Gorge of Samaria. There are no trees on the Lefka Ori above 1000 metres, so the locals call it Madares (the bare mountains). The only vegetation is low bushes and a lot of wild flowers. 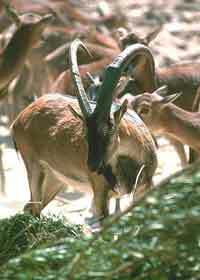 There is luxuriant verdure and wildlife in the gorges, however. Here, the unique National forest of Crete, an area of 48.000 stremmata, surrounds the Gorge of Samaria - this forest has preserved a large part of the rich flora and fauna of Crete. Thick clumps of cypress trees, ever-green oaks and pine trees, springs with an abundance of water, steep rocks and inaccessible slopes - all these make up a place where the unique Cretan ibex (called the agrimi by the locals) still survires, as do the extremely elusive wild cat (felix silvestris agrius-the only known individual is a male, captured in May 1996) and significant populations of polecats, badgers, birds of prey, etc. To the east, the precipitous slopes of the Lefka Ori have their final borders in the Imbriotiko Gorge and the Katre Lago (i.e. the Gorge of Katre). Further east again, the Askyfou plateau rises up, a bare and barren plateau with a semi-deserted village, Asfendou, and a single rough road that goes through it. This road begins just north of the village of Imbros and ends in the picturesque village of Asi Gonia. North of this road, the bare peaks of Agathes (1511 m) and Tripali (1494 m) can be distinguished, while to the south you can see many beautiful gorges that descend to the coast of the Libyan sea. Continuing in an easterly direction, you cross a semi-mountainous landscape with many peaks (all under 1000 m) and many level cultivated areas with pastures between them. Throughout this region, there are many small scattered villages of farmers and animal breeders, totally uninfluenced by tourism as few tourists visit them. To the south there are the impressive Gorge of Kotsifou and the Kourtaliotiko Gorge, inside which are squeezed the roads that lead to the tourist beach at Plakia and to the historic monastery at Preveli. From the beach at Plakia going east as far as Aghios Pavlos (St Paul), the massif of Siderotas (1136 m) protects from the deluge of tourists some of the most beautiful beaches in Crete that are hidden behind it - an example is Tripetra Beach. To the north-east of Siderotas, Kedros (1777 m), another massive grey rock rises up, and between them runs the main road from Rethimnon to Ierapetra. Both the road and the two mountains go in a north-west to south-easterly direction. The extremely beautiful Amari valley has exactly the same orientation - this opens up north-east of Kedro and is a very green, protected region that has been inhabited continuously since Minoan times. Today, about twenty or so of the most picturesque hamlets in Crete nestle here. Immediately above these villages, the main Psiloritis range stretches out, having the same orientation (from north-west to south-east). It begins to rise smoothly at Moni Arkadiou and reaches its maximum height at the peak of Timios Stavros (the Holy Cross), 2.456 m, the highest peak in Crete (just a few metres higher than the peak of Pachnes in the Lefka Ori). The small Chapel of the Holy Cross dominates the summit, a humble Christian continuation of the very ancient Minoan tradition of building peak sanctuaries. The impressive of Nida plateau stretches out to the east, at a height of 1.400 metres, enclosed by snowy peaks and bare mountain slopes. On one of these, the Ideo Andro is situated, the cave where, according to mythology, Zeus grew up, and a little further south is another Minoan sacred cave, the cave of Kamares. Apart from these, there are hundreds of explored and unexplored caves in Psiloritis, a true paradise for speleologists. To the south, the mountain slopes of Psiloritis are steep at first and then come down smoothly to the plain of Mesara. The road goes by in the transitional stage; this comes from the villages of Amari and ends at the main road from Iraklio to Gortyna. This road passes through a dozen or so large and small villages built in the shadow of the precipitous mountain slopes, like the picturesque Lochria, Kamares and Vorizia, from where paths lead to the peak of Psiloritis, Zaros with its abundant springs and the head village of Yeryeri. A rough road ascends from the latter towards the north, and it ends in the Rouva Wood, a small island of thick wood with evergreen oaks, pine-tress, and huge cypress-trees; a poor sample of the vegetation once covering the whole of Psiloritis, as its ancient name bears witness to (Idi wooded landscape). On its north-east side, Psiloritis is a sea of both high and low peaks, with rocky bush-covered ravines between them, where one can follow some of the most impressive mountain routes in Crete. On the northern foot of the mountain and in the valley that opens up between Psiloritis an Mount Kouloukonas, there is a crowd of picturesque villages like the legendary Anogia, Zoniana with its interesting cave, Kalamos and Pasalites with their old neighbourhoods. The valley of Mesara begins south of Psiloritis, and stretches out towards the east - it is the biggest and most fertile plain on the island. It has a length of approximately 40 kilometres, a width of between 5 and 20 kilometres and most of it is covered with plastic greenhouses. It was formed by a tectonic earth submergence that left the Asterousia Mountains projecting as independent mountains. The Asterousia, which retain their Homeric name, is a small unexplored mountain paradise with few visitors and even fewer inhabitants but is full of outstanding mountain trails. East of the Asterousia, after a small hilly area, the mountain slopes of Dikti, or the Lasithiotika mountains as the locals call them, rise up steeply. They stretch for a length of 10 kilometres and a width of 5-6 km in a horseshoe shape, and they hug the famous plateau of Lasithi. The highest peak is Dikti (2.148 m) and is followed by many others higher than 1.500 m. Between them, less well-known but much more beautiful plateaux than the touristy Lasithi plateau have been formed, like the Nissimo plateau to the north, the Katharos plateau to the east and the Omalos plateau to the south. On Dikti, the thickest woods in Crete have been preserved until today, through which pass many impressive mountain trails. Every summer, however, many fires are steadily reducing these beautiful woods, so visit them while they are still there. 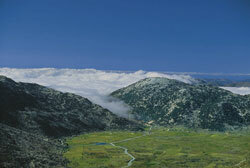 The final mountain range in Crete at its eastern edge is Thripti with its peak of Afendis Estavromenos (1.476 m). Recently a dirt road was opened all the way to the summit, from which, at a glance, you can embrace the whole prefecture of Lasithi – the poorest and most barren but also the purest and most beautiful corner of Crete.